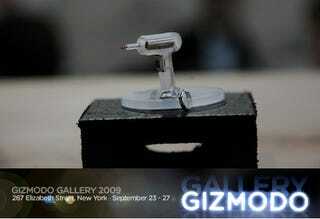 At Gizmodo Gallery 09: Freakishly Tiny Drill! The Tiny Drill serves absolutely no purpose. It doesn't mean we don't love it. Seriously, look how small the damn thing is! And it comes with its own case/holster that doubles as a keychain! Konstantin Leonenko made these from little more than a watch battery, a tiny motor, a switch, molded plastic, and the smallest drill bit we've ever seen. Konstantin says that he came up with the idea one day while on a trip to Berlin, and already knew he wanted to make it using a laser cutter. The original prototype was made using sandwiched pieces of acrylic, but later models moved to a skeletal, one piece design. Leonenko likes it because it pays tribute to one of the most widely used tools. Know why we love it? Because it's SMALL. So come by and check it out at some point during the week. You can even compare it to the 103-inch TV if you want. Also check out the Tiny Drill site for more info on Leonenko's master work.